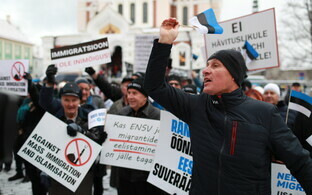 According to the Police and Border Guard Board (PPA), there was no attempt to interfere with the conducting of a lawfully organised public meeting being held in front of the Riigikogu on Monday, 26 November, due to which there is no basis for launching a criminal investigation into the matter. 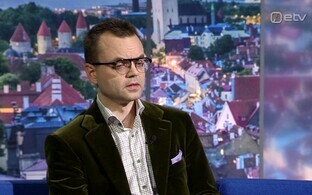 A representative of the Conservative People's Party of Estonia (EKRE) filed a criminal report with the police on Monday on the basis of § 158 of the Penal Code, which addresses interference with or violent dispersion of lawfully organised public meeting, according to a PPA press release. The police assessed the circumstances detailed in the report and found that they lacked the basis for launching a criminal investigation. Only actions that are directed at either having the public meeting cancelled or influencing it in such a way that the shaping or expressing of its sentiments remains unachieved can be deemed as interfering with a public meeting. 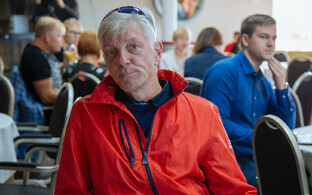 "The goal of Indrek Tarand's actions was not to disperse the public meeting," explained Central Tallinn Police Station chief Kaido Saarniit. "Rather, with his statement, he became a participant in the public meeting. Interfering with a meeting and disrupting it are not the same thing. According to the Constitution of the Republic of Estonia, everyone has the right to express their opinion. We can question whether such behavior in that given situation was appropriate, but no indicators of a criminal offence were present in this action." According to the report filed with the police, an EKRE representative claimed that a microphone belonging to the party was broken during the incident in question. 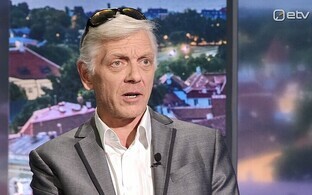 "As the microphone was snatched from Indrek Tarand's hand, he cannot be blamed for it being ruined, and this was not deliberate damage to the microphone," Saarniit said. "In a situation where there is a risk that a verbal conflict may escalate to a physical one, we encourage people to always call in law enforcement officers to help," he added. 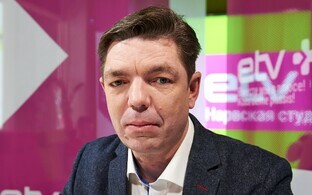 A criminal report filed by MEP Indrek Tarand (SDE/S&D) himself, meanwhile, led the PPA to launch a criminal investigation after he was physically attacked at the EKRE-organised protest. 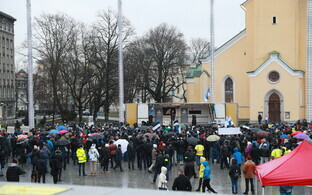 The opposition EKRE had called on its supporters to gather outside Toompea Castle, the seat of the Riigikogu, to protest against the UN Compact on Migration on Monday morning. A few hundred people followed the call. 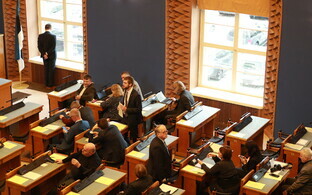 Several politicians of the coalition Social Democratic Party (SDE) were there to meet with the protesters, among them party chairman Jevgeni Ossinovski, Minister of Foreign Affairs Sven Mikser, and Minister of Entrepreneurship and Information Technology Rene Tammist, as well as several MPs. 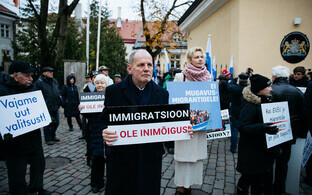 Also present was the party's top candidate for Pärnu, MEP Indrek Tarand. SDE and EKRE are sharply divided on the issue of the UN compact, though the rift predates the current episode; spokespersons of both parties said that they couldn't be in office with one another. The protesters reviled the SDE members and refused to let them speak. Tarand went for the microphone, at that point held by EKRE parliamentary group chairman Martin Helme. "If you don't want hundreds of thousands of refugees to come here, then vote for the Social Democrats," he said into the mic. "I was a victim of physical violence, and as a law-abiding citizen I filed a police report after what happened," Tarand had told ERR on Monday. "This kind of public attack seriously cannot be allowed." He added, however, that he was not injured in the scuffle. 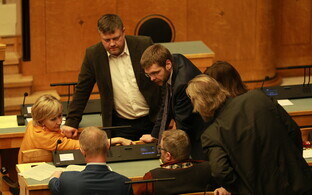 EKRE representatives claimed both during the protest as well as in the Session Hall of the Riigikogu afterward that Tarand was drunk, even after the PPA had released a statement confirming that the MEP was confirmed sober. "Of course I wasn't," the MEP told ERR. Responding to a query by ERR, the North Prefecture of the Police and Border Guard Board (PPA) confirmed on Monday that a criminal investigation on the basis of the section of the Penal Code regarding aggravated breach of public order was launched together with the Prosecutor's Office in order to determine all of the circumstances surrounding the incident.